Gerry Gibbs’ album Gerry Gibbs Thrasher Dream Trio truly lives up to its name. Not only are bassist Ron Carter and pianist Kenny Barron on the bill, but all the musicians proffering stellar performances; making it known that each musician not only understands where the other is coming from, but also that each communicates with some kind of transcendent empathy. This is not a phenomenon that occurs in some of the songs, but in each of the fifteen charts featured on this album. Fifteen songs and there is seemingly not one repeated note or phrase, which is something to marvel at. And while creativity is at its highest—just look at who’s on the CD—the masterful control over what can be said and what must be said is complete. Never is anyone over the top with mere virtuosity, but each statement has deep and relevant meaning. For instance, Kenny Barron’s solo on Thelonious Monk’s classic chart “Epistrophy” is superbly crafted with the pianist building each phrase in his solo out of the root note of each of the changes, so it sounds quite magical and goes on to make a considerable edifice out of Mr. Monk’s tune. This is not only so of Mr. Barron; Ron Carter’s magnificent solo on McCoy Tyner’s chart, “When I Dream” is another example of sheer genius not just for the manner in which Mr. Carter develops it but also the sheer beauty with which the complex changes are handled. Mr. Gibbs is a true revelation. To be able to sit in with such giants of music as Ron Carter and Kenny Barron and to play with such calm, and to bring off such masterly stick and brush work is awesome. Once again, “Epistrophy” is an outstanding example of Mr. Gibbs’ ability to negotiate complex and angular rhythms that were a staple of Mr. Monk’s writing. But that is not all; Gerry Gibbs is a most melodious drummer and that has nothing whatsoever to do with tuning. On the contrary Mr. Gibbs searches for absolute tone when he plays. This suggests that he has listened carefully to his Papa Jo Jones and his Max Roach assiduously. Moreover, Mr. Gibbs has the good fortune of a great foundation from the outset, listening to his father, the great vibraphone player Terry Gibbs. And the son does glorify the father sometimes, which is absolutely true in the case of the younger Mr. Gibbs. The drummer is a superb colourist. Listen to his almost brazen and bronzed brushwork on “The Shadow of Your Smile” and comparing that with the dewy autumnal hues of “Woman on the TV Screen” is something truly exquisite to the ear. Of course it is not just brushwork that sets this drummer apart. His stick work is outstanding as well. And then there is the ability to handle tempo without faltering, which is the hallmark of Mr. Gibbs’ performance on “Eye of the Hurricane,” “Sunshower,” “Here Comes Ron” and on the flawless “Impressions”. This is not to suggest anything less of the other charts, but space sometimes forbids detailed discussion; and a mere listing would be quite pointless. It also bears mention that Mr. Gibbs did not simply score Kenny Barron and Ron Carter for the date; certainly not because he was his father’s son. His musicianship does speak for itself. And of course Mr. Carter and Mr. Barron perform with magical touch. In fact at times—especially on charts such as “Eye of the Hurricane” and the angular “Tell Me a Bedtime Story”—it almost sounds as if the duo were in a session with Miles Davis; such is the intensity and the perfection that they achieve. It comes from not only being on the top of their game, but it would be remiss not to say that these two men are what can only be termed as great musicians and it is their performances that make this album one of the finest of 2013, when it was released and certainly a memorable one for a lot more time to come. Track List: Epistrophy; Promises, Promises; When I Dream; The Sandpiper: The Shadow of Your Smile; The Woman on the TV Screen; Eye of the Hurricane; Tell Me a Bedtime Story; A Feeling; Don’t You Worry ‘Bout a Thing; Sunshower; Hear Comes Ron; Impressions; The Thrasher; Mr. Clean; The Theme. Personnel: Gerry Gibbs: drums, Ron Carter: bass; Kenny Barron: piano. By the time he was 18, Gerry had already become a professional musician. He worked steadily with his father’s many groups, featuring numerous configurations, performing frequently in Southern California as well as touring. Between ages 18-22, Gerry had already performed as a sideman with: ALICE COLTRANE, WOODY SHAW, DONALD BYRD, BUDDY DEFRANCO, HAROLD LAND, BENNY MAUPIN, DOUG CARNE, LARRY GALES, HORACE TAPSCOTT, FRANK MORGAN, CONTI CONDOLI, FRANK ROSOLINO, ALAN BROADBENT, ERNIE WATTS, BILLY CHILDS as well as PARLIAMENT FUNKADELICS AND ROSE ROYCE among many others. In 1987, at age 23 and seeking greater challenge and exposure in the mecca of the Jazz Music scene, Gerry packed his bags to relocate to New York City. Within his first 3 weeks of arriving, Gerry took over for drummer WINARD HARPER, 6 nights a week, as the house drummer for THE BLUE NOTE JAZZ CLUB ‘AFTER HOURS BAND’ (led by saxophonist JUSTIN ROBINSON and which also included pianist STEVEN SCOTT). During this time, WINARD HARPER & PHILIP HARPER OF THE HARPER BROTHERS would call upon Gerry to be sub for Winard during local and European Gigs. Gerry continued on becoming sought after both as a sideman and as a leader and his performance schedule included numerous domestic and international touring. His many past projects, during his early years in NY, included leading an adventurous Keyboard Trio featuring: BRAD MEHLDAU, BILLY CHILDS & GREG KURSTIN (Mega-Pop Producer/Keyboardist). It featured 13 keyboards and drums! Another Trio project,”THE THIRD TRIO FROM THE SUN” from 1999 – 2002, included the use of 25 instruments between them and featured Alto Sax Legend ARTHUR BLYTHE along with 4 African Dancers. In 2000, the trio released “First Visit”(VIEWPOINT RECORDS). During the early 2000′s, Gerry performed concerts that featured his writing abilities. Among them, a 40-piece ensemble consisting of Big Band with Gospel Choir, Rapper, Sitar and 6 piece Rhythm section. The ensemble was selected to open up for New Orleans Piano legend: Dr John. Gerry also found time to lead an 18-piece Big Band for which he wrote and/or arranged all of the music. The band is captured in the Live CD recording: Gerry Gibbs & The Thrasher Big Band -” LIVE AT LUNA” (Whaling City Sound Records).The CD garnered 3.5 stars in DownBeat magazine and went to #41 on the Jazz Week. The Thrasher Big Band also backed up “live in Concert”Jazz luminaries: TERRY GIBBS, CLARK TERRY, JAMES MOODY & JON HENDRICKS. Gerry’s earlier bands were often a sought after choice for performing at the world famous VILLAGE GATE in NYC between 1992-1995. In a 3 year period, his various projects performed 18 one-week engagements to packed audiences. Gerry would later take one of his well rehearsed bands out on the road. It was during an engagement in Los Angeles that Gerry and his band caught the eye of Drummer/Producer STIX HOOPER which led to Gerry’s first signing by a Major Label as a Solo Artist. In 1995, Gerry finally released his first CD for the QWEST/ WARNER BROS label. 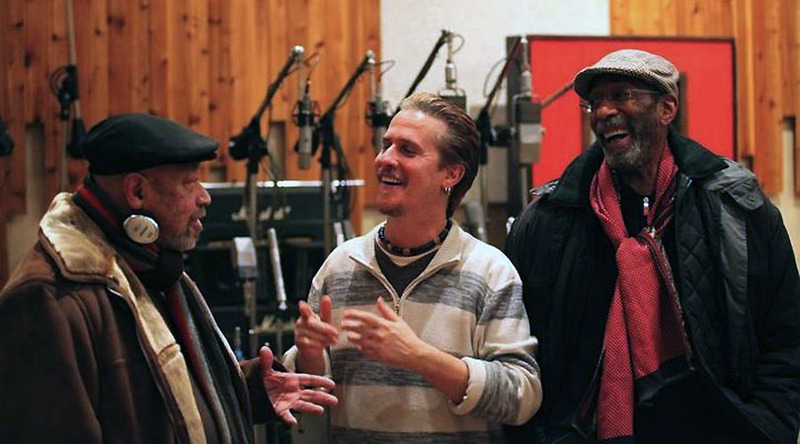 The CD was produced by STIX HOOPER of THE JAZZ CRUSADERS with Executive Producer QUINCY JONES and featured Gerry in both the drumming and writing chair composing and arranging all of his original music. Gerry has gone on to record 7 more CD’s under his own name for various record labels. 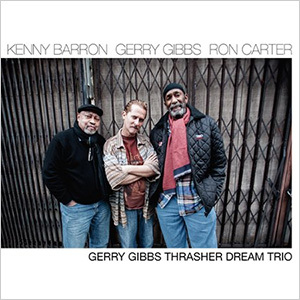 His most recent CD is the Trio Recording:”GERRY GIBBS & The Thrasher Dream Trio -Featuring KENNY BARRON & RON CARTER” (Whaling City Sound Records). Gerry continues to live in NYC where he works frequently as a sideman and leader in many diverse projects. Plans are already in the works for a forthcoming THRASHER DREAM TRIO recording, this time featuring: STANLEY CLARKE & GERI ALLEN and to be released later in 2014 (Whaling City Sound Records).